Select Home Elevations tool lets you custom design your new modular home exterior. View different roof, siding, shingle, and shutter combinations. See what the outside of your new modular home will look like. Customize your Select Home Elevation’s curb appeal. Although Select Homes, Inc. has hundreds of standard floor plans for modular homes homes, most buyers select from about 15 standard plans and customize their new home to meet their needs. You will usually find a modular home plan that meets your needs in the top ten plans. You will save thousands by building a standard floor plan, customizing it with your own standard options. A limited number of standard Select Homes, Inc. floor plans are available with the Select Home Elevations created by the tool so meet with a design specialist to finish your design. Call 1-800-FACTORY for an appointment. Please note, you must have the land where you want to build in Select Homes market area, to get a project price. With the Select Home Elevations tool, and the hundreds of standard floor plans, you will find a design that meets your needs and you can be proud of. 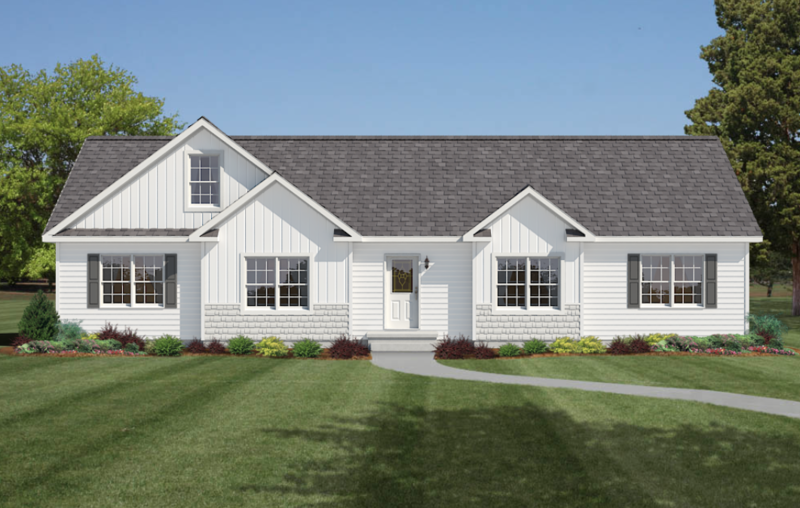 Modular home floor plans show the location and size of rooms and walls, the exterior elevations, reveal what the finished house will look like on the foundation. Most modular home plans are available in many different exterior elevations. First choose your floor plan, then choose your extertior. Each of our modular home floor plans are available with different exterior looks. Porches and garages may be built on any Select Home. Select Homes, Inc. build True Modular™ Homes on your land in North Carolina. True Modular™ means better built. Elevation tools not applicable to all floor plans. Select Home Elevations are subject to change without notice. A Select Homes, Inc. contract supersedes any Select Home Elevations illustrations. Select Homes, Inc. assumes no liability for unavailability or misinterpretation of elevation design. Here's the grand list of 2,000 uses for WD-40. It's a PDF file you can download. The Greensboro by Select Homes, Inc.